November 2nd thru November 5th, In conjunction with the Shanghai Summerset Gallery Hugh Mesibov has works on display. 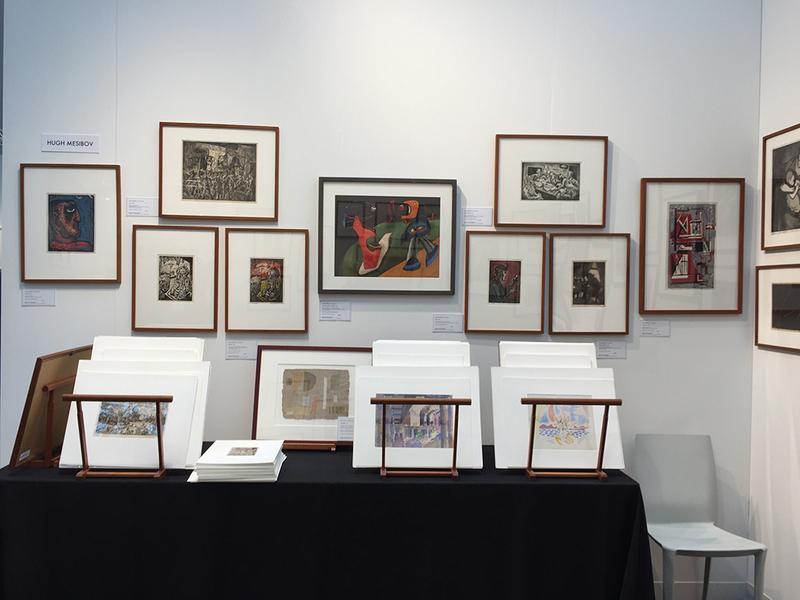 2017 Fine Art Print Fair at the Javits Center in NYC, was an important event for both print lovers and Hugh Mesibov whose artwork scored an entire wall of works with his gallerist Susan Teller Gallery and her presentation of American Works on Paper 1920s-50s including the Urban/Industrial Scene, Surrealism, and Modernism. The Collections Committee of the James A. Michener Museum recently accepted a gift of 21 works of art from The Mesibov Family. This gift has been in the works for nearly 8 months and includes WPA prints, ink and watercolor works on paper, and a large acrylic on canvas titled "The Hunt", 1980. Originally the collection did not include this large canvas. 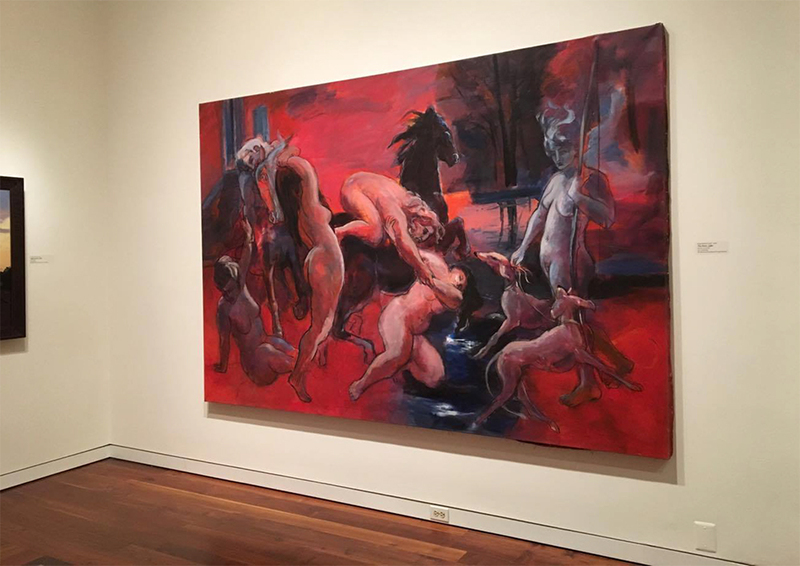 However, Chief Curator Kirsten M. Jenson was so moved by the nature of this painting and its expression of mythological subject matter that her request for this special piece moved the family to include it in the gift. "The Hunt" now hangs in the permanent Contemporary Collection. She is excited to add all these works to the Michener collection and thanks The Mesibov Family for generosity and support of the museum's collection-building effort. This show which opened September 5 at the Zimmerli Art Museum at Rutgers, explores how the technique was adapted to create fine art that was accessible and affordable to the middle class during the 1930s and 1940s. Despite the nation?s worst financial disaster, public support for the arts reached one of its highest levels in history. While murals in public buildings, photographs of rural and urban families are probably the most widely known projects accomplished by the WPA, a collaborative environment also allowed for the development and dissemination of screenprints. ?WPA initiatives emphasized the value of artistic expression in everyday American life,? notes Nicole Simpson, the Zimmerli?s Assistant Curator of Prints and Drawings. ?Artists decided to use the term ?serigraph? for these prints to distinguish them from the strictly commercial screenprints that had been produced for centuries. They created the prints in editions, which were widely distributed and readily available for people to display in their homes. 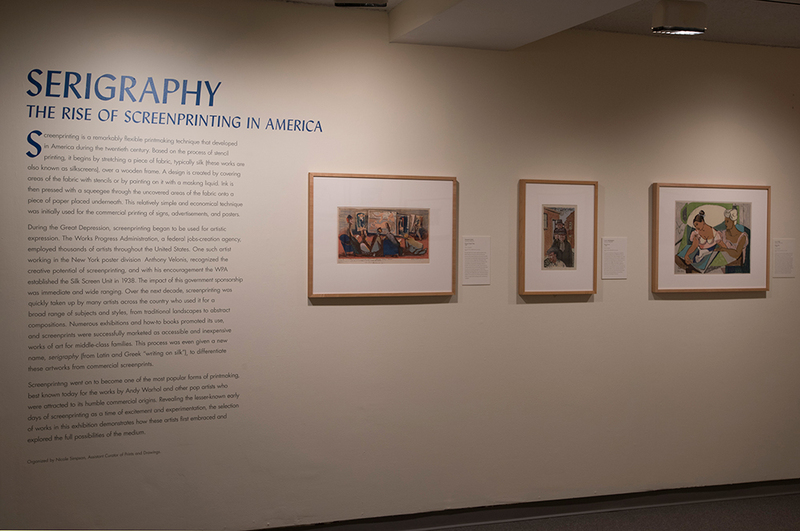 This increased acceptance of screenprinting was a pivotal moment in the conversation about the role of art and its audience in the United States.? Active from 1935 to 1943, the WPA was the most ambitious American New Deal agency, employing millions of people to alleviate long-term unemployment during the Great Depression. Work relief provided jobs and income for individuals, proving to be more effective than handouts. While most workers carried out public construction projects, an important element was the Federal Art Project, which employed artists across all disciplines, many of whom proceeded to pursue active, influential careers during the second half of the 20th century. The process of screenprinting is vividly brought to life in a group of five works by Hugh Mesibov, who worked for the Federal Arts Project in Philadelphia (where he, Dox Thrash, and Michael Gallagher developed the carborundum mezzotint technique). 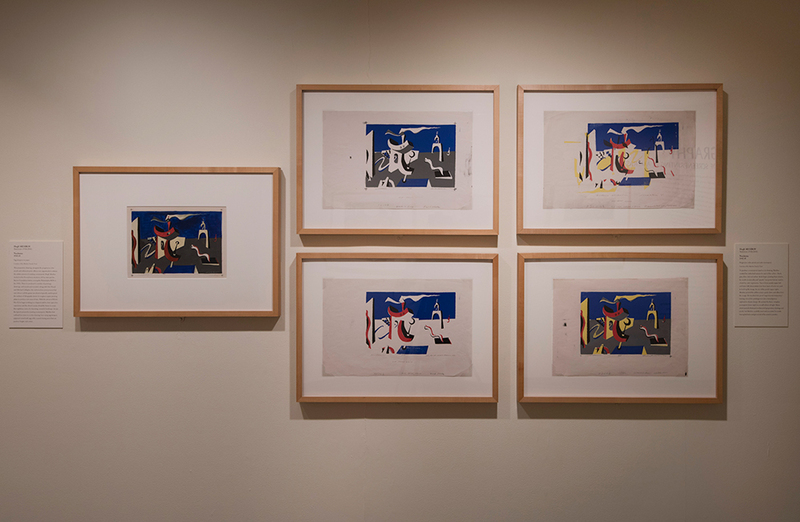 Multiple stages of his 1942 Nocturne, on loan from the Mesibov Family Trust, reveal the entire process: the original inception of the design in an egg tempera drawing, the process of printing from multiple screens visible in working proofs, and the completed screenprint. In this print, one of his earliest experimentations with screenprinting, he expressed the anxieties of World War II, drawing upon his experience working in the shipyards to produce this haunting, dreamlike landscape. A reception is planned for October 26th, 2016 from 6 pm - 8 pm in the Popper Gallery at the Yeshiva University Museum. 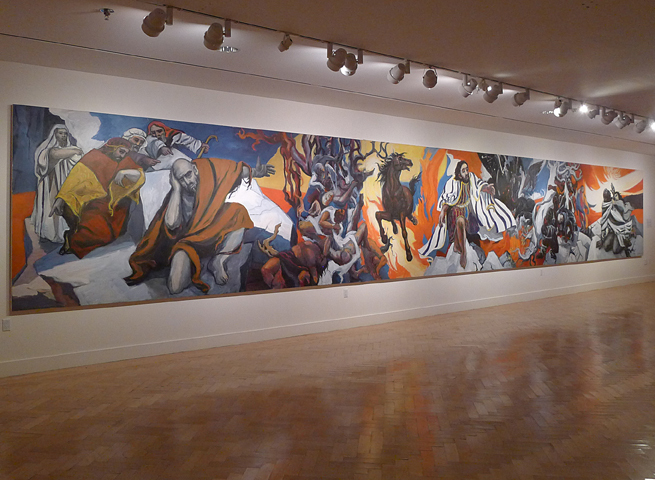 In 1969, Temple Beth El in Spring Valley commissioned a huge mural illustrating the Biblical account of the suffering and redemption of Job. The Rabbi at the time, Rabbi Frishman, felt that it was important Mesibov use figurative rather than more contemporary forms such as abstract or expressionist art to tell this story. Funding was provided by congregants Jeanne and Warren Levin. The mural was completed in 1972. Temple Beth El merged with Temple Beth Torah of Upper Nyack in 2016. Temple Beth El was slated to be demolished, and the congregation reached out to YU Museum to provide a home for its mural. Yeshiva University Museum is located in the Center for Jewish History, one block west of Union Square. 15 West 16th Street, New York, NY 10011, Between 5th and 6th Avenues. 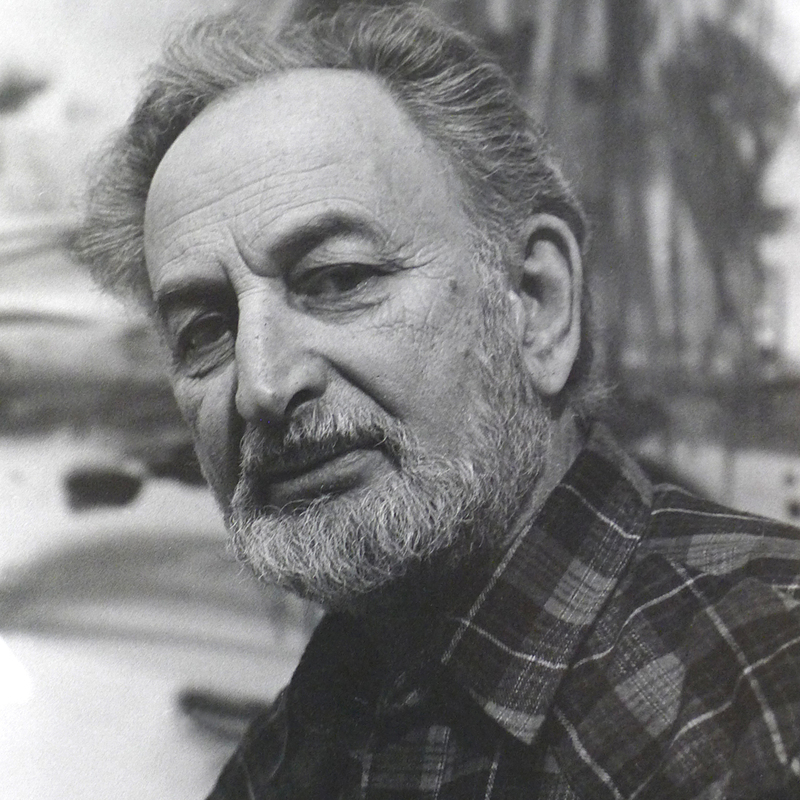 Work by Hugh Mesibov is in the permanent collections of the Metropolitan Museum of Art, the Whitney Museum of American Art, New York University, and Syracuse University, NY; the Philadelphia Museum of Art, the Pennsylvania Academy of Fine Arts, the Free Library of Philadelphia, the Barnes Foundation, Merion Station, and the Carnegie Library, Pittsburgh, PA; the Worcester Museum of Art, Massachusetts; the Library of Congress, Washington, DC; the Art Institute of Chicago and the Mary and Leigh Block Museum of Art, Northwestern University, Evanston, Illinois; the Wolfsonian/Florida International University, Miami Beach; the Museum of Art, the University of Oregon, Eugene; the Newark Museum, New Jersey; the Baltimore Museum of Art, Maryland; and the British Museum, London. Hugh Mesibov died peacefully in his sleep at home in the early morning of March 24th. His life was full of family and friends, students and colleagues, all who loved and respected him as an artist and a man. He is survived by his beloved wife of 67 years, Eudice Charney, children Christopher, Paul, and Deborah, six grandchildren; Alex, Rachael, Jared, Jamie, Nicholas and Sarah. All of his family loved him deeply and miss him already. He was a fun and funny guy who never strayed from a dinner table full of silly jokes and groanworthy puns, a dad who loved to play with his kids yet could be a stern facilitator of truth and practicality. Though art was his life force, Eudice was his muse and that devotion flowed throughout their lives till his last breath. Hugh Mesibov online presence is now extended to a Chinese language website. 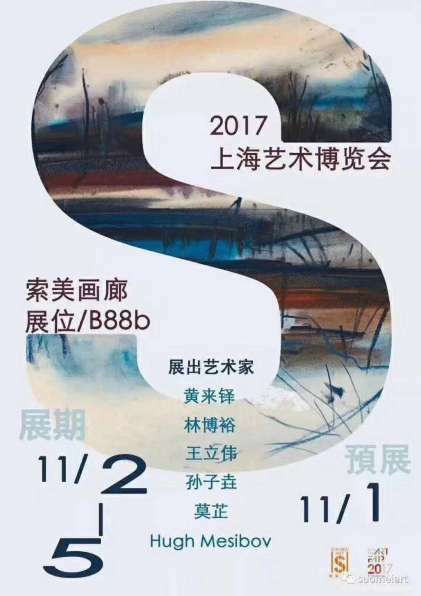 Through this website Mandarin readers will have access to Mesibov's art activities going on in the Chengdu China, Sichuan province and surrounding areas. For more information please click here. On May 27th, Mesibov's work "The Bombing of Nanking" will appear in the exhibition for the Donation Ceremony in USA of Japanese Invasion of China in Pictures?Key Book of Shandong Publishing Group Co., Ltd.
On April 28th, the Awareness 2015 International Exhibition of International Artists will open at the U37 Creative Warehouse in Chengdu China. Included will be Mesibov's works on paper from the 1950s through the 1990s. Hugh Mesibov announces new website hosting his works. Hugh Mesibov, 20th century American artist is celebrating the opening of his new website (hughmesibov.com). Celebrating over 75 years of his abstract expressionist works, this site provides an in-depth look into his style and his process. Hugh Mesibov, born in 1916, is one the the few if not the only still living WPA artists.